Entrepreneurial is no the only required trait for being a successful self-starter and start up founder. Going into business for yourself requires a multitude of life skills and business smarts that extend well beyond that of the average business-man or woman. The success rate for entrepreneurs is abysmally low, standing at a .4% success rate according to business insider. While we have never had a true guide to what makes a great founder, current culture and the world of television have gotten us a little closer to understanding what it takes. The ABC show Shark Tank which premiered in 2009, features a panel of venture capitalists and angel investors looking to be impressed with a product or company to the point of investing. This has provided an extensive look at entrepreneurs across America, what brings them together, and what sets them apart. 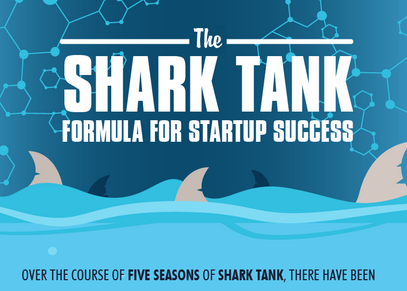 Take a look at the infographic “The Shark Tank: Formula for Startup Success” for a look at some of the data pulled from the hit entrepreneur show, and what its numbered seasons have taught us about what it takes to start your own business. You’ll learn about preparation, limitations, and receive a cursory guide into how to brainstorm and nurture your startup idea.